There is no better way to describe the idea beind Tefal’s new Fresh Express mini food processor other than brilliant! It’s like an old fashioned grater but quicker, cuter and much safer to use. And, thanks to Kitchenware Direct, I’m giving one away! I was a little sceptical of it at first, but considering the amount of chopping and dicing and slicing I do in my kitchen, I thought I’d give it a try and, mostly, it didn’t disappoint. French made, Fresh Express is a real time-saver in the kitchen. Sliced cucumber slaw is ready in minutes, veggies for salads and soups are ready in no time and you can even slice onion for French onion soup tear-free! It grates cheese for pizza, potato for rosti, green mango for salads, cucumber for dips, zucchini for tempura without you ever running the risk of grating your fingers, which is always a plus! Having said that, some of the jucier fruit and veg tend to turn a little mushy on the finer attachments, but that’s fairly predictable even with a regular grater – I’ve tried green mango and cucumber on both. The processor comes with 5 colour-coded drums, each performing a different grating function. Along withthe power cord, they store right within the unit to keep clutter to a minimum. An easy to follow recipe booklet to get you on your way is also included. Set up and clean up are child’s play too – just pop the interchangable chopping attachments in, use them then into the dishwasher and you’re done. While the two-handed operation of the unit may seem a little cumbersome, I like it as a good safety feature, especially when there are kids around. All in all, I’m happy to say that this little guy has now become one of the most used appliances in my kitchen. Unlike the meat-mincer, fruit juicer and yoghurt maker I’ve only ever used once. …simply leave a comment on this post telling me what you would make using Tefal’s Fresh Express. Wow, thank you to everyone who enetered the competition! You’ve come up with some amazing usage ideas for this nifty little processor and I have had much trouble picking the winner. So, I picked two!!! Congratulations to Sneh and Lucy B! Sneh, you charmed me with your Asian thread salad with raw mango – you know exactly what I like and you made my tastebuds dance just at the thought. Lucy B, I love a good coleslaw and I’m happy your daughters have recently disovered it too, but for me your idea of “healthying up” the old sausage roll and wonton bits with veg has sealed the deal. I’ll be in touch to get your postal details! Enjoy! 77 Easter Egg Decorating Ideas! I would really love to win this one! It is so cute. I would make a Spicy Asian Thread Salad …. purple cabbage, carrots, green cabbage shredded into thin threadlike ribbons, finely chopped green chillies, spring onions, peanuts and coriander. Some grated cucumber and raw mango with a sweet and sour dressing!!! Hi Martyna, I would attempt to recreate the very light and fresh ‘slaw I had at Kitchen By Mike. It was divine and I’ve been dreaming about it ever since! My dad has this and he LOVES it!!! He uses it to chop up vegetables to make lumpia (Filipino spring rolls) so I would totally use it for that. I’d also use it to chop all the vegetables I need for my salads AND for my Live Love Glow April challenge yaaaaaaaaaaaayayayayayaaaa… Hamish gets harassed, often at 11pm to “please julienne these carrots for my salad”… etc, etc… he DOES it but I know it’s MEAN of me to ask him. THIS MACHINE COULD POTENTIALLY SAVE MY (future) MARRIAGE!! hahahahaahahaa. Sigh. My knife skills are lack luster at best. Very cute processor! Completely off topic but what brands of smoothie makers are available in Australia that really can crush ice. Finally my osterizer blender, that is probably older than you are died, and every day my son wants smoothies with ice. I need an industrial type. I just bought a Phillips brand smoothie maker here in HK and it is not meeting our needs. Suggestions? Hi Bam, I actually use my Braun stick blender to crush ice and frozen bananas in smoothies. I prepare them in a large Pyrex measuring jug. The chopping bowl attachment with blades is also great for crushing ice for cocktails, drinks. They are very hardy tools! I’ve had mine for over 6 years now and it still does the job well! Definitely for juice concoctions!! Love all of the vibrant colors! The cooler wet weather up here in Brisbane has me thinking of winter and this would make life a lot easier when making a nice hearty ratatuouille to keep away the cold! I have been waiting for your giveaway to open for several days (so no wonder I’m the first one to enter, i really really want to win)! I failed in love with Tefal Fresh Express a few weeks ago when I saw it in its cute box at the shops. 1) I want to make French rataouille, tian, vegetable lasagnas and delicious vegies gratin. Tefal Fresh Express would make the tasks so much easier. 2) I’m passionnate about nutrition and share healthy tips with my readers on my blog (healthy lifestyle inspired by French culture). 4) I don’t own a few processor and do everything manually – painful. 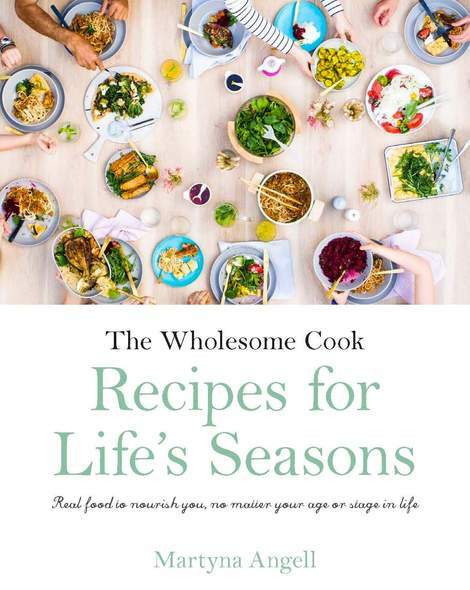 5) You would make me very very happy and I would be a very grateful and loyal Wholesome Cook blog reader! Pawpaw salad definitely- much easier to use the Tefal Express than all that chopping, mix in the fish sauce, lime, chilli lime and sugar, sprinkle with peanuts and yum up a healthy, zingy salad. Please!!!! Just last night my daughters (2 and 5) finally discovered coleslaw, which I’ve been grating and chopping by hand. And I’d use it for sausage roll veg AND wonton inside bits! What a cute looking food processor! A perfect little helper in the kitchen that would also store away easily. Oh My Goodness! This is so exciting! I would love to make my favorite cold summer soup – I call it “beet gazpacho” though it’s just my version of Russian cold borscht! Instead of being tomato-based, the “broth” is made from boiling beets! You then slice up lots of fresh veggies (cucumber, radish, bell pepper, parsley, etc. ), crumble up a hard-boiled egg, add a grain/starch (i.e. cooked potato or quinoa – optional! ), and a spoonful of plain greek yogurt! YUM! While the season may not be right just now, I love making zucchini slice which does involve a fair bit of grating; onion, cheese, zucchini. I imaging it would be so much easier, quicker, and I’d probably have all my skin still attached after making it. I’ll use it to grate potatoes for home-made hash browns, served with bacon and eggs for a tasty (not so healthy) weekend breakfast! Bon appetit! I’m in the US so don’t count me in, but I am loving this food processor!!!! I hope I can find it here. So cute and looks great! I would make one of our favourite side dishes, a Greek style zucchini salad with lots of grated zucchini, feta, mint and green onion with a lemon dressing. My partner and I can shamelessly plow through huge amounts of zucchini, so this super cute food processor would be a huge help! I would use this processor for grating APPLES: for my fresh Bircher Muesli, apple crumble, apple stuffing for chicken, apple tart …… and the list goes on. It is such a nuisance grating by hand AND using my huge processor just for smaller quantities. I would use it for carrot muffins…lots to peel and cut. I would use it for my Asian noodle bowl I made… lots and lots to cut. I would use it for salads….lots to cut. I would use it for my boys…for some reason veggies are more fun to eat when they are tiny. 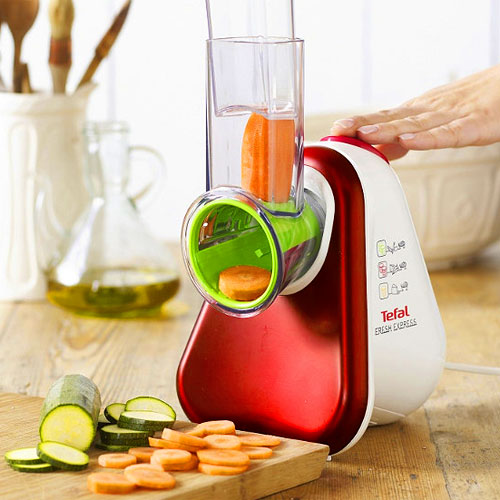 It is such a cute colourful machine with so many accessories – I would use it to grate potatoes and carrots for my regular weekend hashbrowns, slice wafter thin cucumber for my crab meat sandwiches, now that winter is on its way, slice vegies for my favourite minestrone soup or for vegetarian curries. Best of all, it would finally give my fingers a break from bandaids! I can’t enter, but I’ll answer anyway. One of those asparagus salads. Katherine keeps suggesting those. Good luck to all the Aussies. Oh, yes please! I looove making the Northern Chinese dumplings (jiaozi), but HATE finely chopping the chinese cabbage to put in them. This would make the entire process enjoyable, and I love love love anything I can use then throw in the dishwasher! great giveaway! I’d make pizza! slice up some potatoes and grate cheese for the toppings, nom! I am only a beginner cook. But with 2 children (aged 1 and 2), and another on the way, I am desperately trying to learn some healthy, tasty recipes. I would use it to make the zucchini slice (all those hidden veggies!!!). And use it for cutting onions, carrots, etc etc. I am terrible at cutting so anything that makes a job safer for me is a winner. Looks like a handy little tool. I’d use it to make “veggie” pasta, since I don’t eat grains anymore but LOVE pasta sauces (putanesca and pesto are my favourites) on veggies. Hi! First time commenting, but I’ve been enjoying your blog for a long time 🙂 Always beautiful & inspiring photos! I would love to try this machine! It’s so attractive as it seems so compact and handy. I’m a Japanese and love cooking all sorts of food. This machine would be so great to chop the veggies for my damprings or Kimuchi. I also wonder if it has the slicer to slice potatoes for scallop potato or hash-potato. I really like the compact size of this as I usually don’t like using my giant food processor (I hate cleaning up the machine!). I would use it to make greek moussaka: it would be perfect to thinly slice eggplants and will save me a lot of time! I would use it to slice onions – it’s normally so painful! So I would make something like a pissaladière. What a cute little food processor! Definitely handy to have when doing lots of chopping or grating. Ooh, a rainbow salad similar to Jamie Oliver’s, made with different colours of beetroot, carrot and red onion 🙂 Then I’d top it off with a light vinaigrette. Healthy, delicious and so much easier with the Tefal Fresh Express! Too cute! I’d get the kids to help me slice and dice fresh vegetables for their lunch boxes and sandwiches. Hopefully it will get them to eat more vegies! ARRRGGHHHHH! Soooo excited! I thank you and my kids and husband do too!